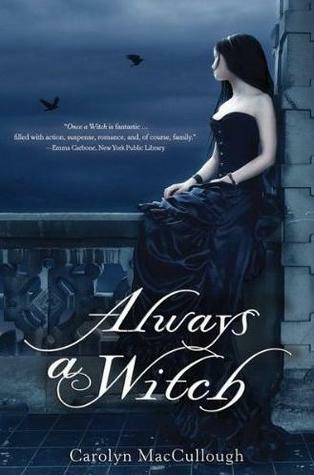 Once A Witch and Always A Witch are two of the best paranormal/fantasy books I've read in quite awhile. Always A Witch begins just where Once A Witch left off. Alistair Knight has traveled back in time to prevent the creation of the Domani and the loss of the Knight family's power. For awhile, it looks like he is going to prevail. The future in the Greene family's book of prophecy is changing, or rather, disappearing. When a strange man travels forward in time to the Greene home and recognizes Tamsin, she knows that she needs to go back to 1887 and stop Alistair from destroying her family's future existence. Tamsin travels back to 1887 and poses as a maid for the Knight family. I love how the fantasy world expands in this book. We see a whole new range of talents, and also see just how they can be used for evil as opposed to good. We understand why it was necessary for the creation of the Domani. The story is consistently interesting. This isn't one of those books that has you plodding through the first 3/4 and then glued to every page for the last 1/4. Instead, the entire book reads at a steady pace, with new plot twists, character development, and world-building that keeps you fascinated. I love Tamsin. She was a strong character in Once A Witch, but is even stronger in Always A Witch. I liked seeing how her personality changed once she realized that she is, in many ways, the most Talented member of her entire family. It's given her a lot of self-confidence. But she still has some humility and insecurities that came from thinking she was a failure in a family of successes for most of her life. The mixture of qualities is actually a good thing for Tamsin. I love how courageous and smart she is. She isn't afraid of standing up to anyone - the Knights, her family, or the 1887 Greenes. But instead of just charging at them and losing, she positions herself to approach people at the time when she is most likely to get what she needs from them. The romance between Gabriel and Tamsin is still here. I love Gabriel. He is handsome and loves teasing Tamsin by turning anything she says into a double entendre. He has a very useful Talent, but his family problems have kept him humble. The two of them are made for one another. I love how Gabriel wants to help Tamsin and Tamsin wants to protect Gabriel - rather than the other way around as most boy-girl stories go. I also like that the romance is not the most important thing to this story. It adds to it rather than defines it. Always A Witch is a satisfactory conclusion to Once A Witch. The ending ties up the series nice - I loved how the book ended, even if it was bittersweet. The only thing that disappoints me is that there will not be another book. Well, that seals it. I should put this one on my tbr. Love the combination of magic and time travel! I totally agree with what you said here. The ending is very satisfying because I felt something. Great review! Awe. I live for good banter between love interests! Gabriel sounds great, and totally swoony. That is quite an opening statement for this review. Now, I need to read this series. The cover for this one is gorgeous! Loved the review! I was a little disappoined cause I felt like the book repeated itself. Though I did love Gabe and Tam. Loved this book. I think Gabriel and Tamsin make a wonderful couple. I like that there is no love triangle and their feelings are pure. I still haven't read Once a Witch, but I really want to because this series sounds great! Good to hear the romance is well done, I like the fact it's not the most important thing to the story. YAY! So glad the second book is just as good or even better than the first book. I enjoyed "Once a Witch" but I didn't love it. Looking forward to reading this one soon! I'm glad to hear you liked this one! I've been intrigued by these books, but haven't checked them out yet, because I've been a little nervous.